2015 ends with a suicide attempt. The lifeboat was asked by UK Coastguard to go and stand by, close to Hayling Bridge, as a man was threatening to jump off into a fairly cold sea. The new D-class lifeboat ‘Jacob‘ was launched, but on its way up the harbour was informed by VHF radio that the man had jumped, closely followed by a police officer. The two men were carried by the tide to the W side of the bridge where they were able to cling onto a mooring buoy. The police officers colleague then threw them a lifebelt, and using the attached line pulled them both into the shore. So when the lifeboat arrived they were ashore and the casualty was being escorted back to the Ship Inn, so the lifeboat crew looked after the wet, cold, policeman. An ambulance arrived shortly after this and the casualty was taken to hospital, so the lifeboat was then stood down and returned to the station. Two rescues on an August Sunday. Weather : Fine with a light F2 SW wind. On a pleasant Sunday afternoon in late August, with a light SW wind, two different casualties found the ebbing tide too much to cope with. The 26ft sailing yacht ‘Bridey’ had earlier suffered engine failure in Hayling Bay but was making headway under sail back towards its home mooring in Birdham Pool. By early afternoon however the wind had dropped and the tide was against them as they rounded the W Pole Beacon and came to a stop. They radioed for help and we launched the Atlantic 85 lifeboat and were quickly on scene. A crewman went aboard and a tow was established to take the casualty to Sparkes Marina. Once in the harbour the Harbour Patrol vessel came alongside and offered them a tow back to Birdham which was gratefully accepted. Before the lifeboat could return to station another call sent us looking for a Wayfarer dinghy said to be ‘drifting out of the harbour.’ We soon found the dinghy which was in fact at anchor and fishing. The lifeboat helm advised the crew that with the strength of the ebb tide and the fading wind they would be unlikely to be able to sail back into the harbour. A tow was set up and the skipper asked if we could take them back to the East Head moorings. Once we had done so and left them at anchor, we advised the Harbour Patrol that they were at East Head in case they needed to be towed further up the harbour. 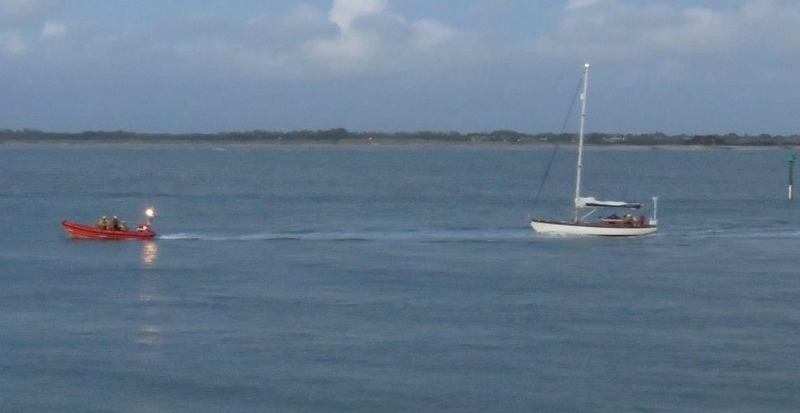 A classic yacht lost all engine power and anchored in a nasty sea over the W Pole Bank off the mouth of Chichester Harbour at 19:00 on Wednesday 26 August. They made a PAN PAN emergency call for help and the Hayling Lifeboat Derrick Battle towed them to safety. The Lifeboat Station crew had assembled for their regular Wednesday evening training session when they heard a PAN PAN emergency call from a yacht ‘Star Runner’ on the VHF radio. The Duty Launch Authority phoned the UK Coastguard and after discussing the casualty, apparently a 13metre 19 ton traditional yacht anchored close to the W Pole mark, it was agreed the Atlantic 85 would launch and go to their assistance. The lifeboat quickly found the casualty but experienced a nasty sea and a rough ride with 4m waves caused by the WSW Force 5 wind and the shallow bank. After being in this sea for some time the casualties’ two crew were exhausted. Helm Andy Ferguson said ‘We approached the yacht to put a crew member on board but the bow of the vessel was moving up and down some 4 metres in the waves and we were in danger of a 13 ton hull coming down onto the lifeboat. On the second run in crewmember Steve Gosling managed to jump onto the foredeck with sea water cascading around him.’ The anchor proved impossible for Steve, the yacht’s skipper, and the crew to get up, so a tow rope was set up, the anchor rope cut and buoyed, and the yacht was towed south to get out of the breaking waves on the bank. All went well and in better sea conditions they turned north for safe harbour but the heavy yacht and the sea movement caused the tow rope to break. Having re-set it the yacht was towed into the harbour, (pictured) an alongside tow was set up, and the yacht was taken to a safe mooring in Sparkes Marina where she was met by the local Coastguards. This was a difficult rescue and one which has caused a former and well respected lifeboat helm to praise Andy Ferguson and the crew for successfully bringing the casualty vessel and her two crew to safety. UK Coastguard alerted us to a call from a member of the public about a sailboarder just inside Chichester Harbour, to the north of the station, and in difficulties. We could see a windsurfer being blown away from the shore onto the Winner Bank and so launched the D-Class lifeboat. Whilst launching a member of the shore crew spotted another windsurfer further north in the harbour and capsized for too long. So the D-Class went to this second casualty, found a very tired windsurfer and so took him and his rig on board the lifeboat and landed him at the lifeboat station. The lifeboat, in the gathering gloom, then went back onto the Winner Bank to look for the other windsurfer, but shortly afterwards he came close to the lifeboat station to let us know he was alright. We advised him to finish his session as it was virtually dark by then and both windy and with poor visibility. Date : Friday 21 August. Weather : Fine with a F3 SSW wind. Transferring to an alongside tow. A power boat en-route from Windsor to Chichester Marina had complete engine failure when in sight of the harbour entrance. The lifeboat was launched, quickly reached the casualty and set up a tow, and brought her into the harbour. The four crew on board were relieved to reach calmer waters. The tow was then changed to an alongside tow (pictured being completed) and the vessel was taken into Sparkes Marina. Small inflatable blown out to sea. The lifeboat was initially tasked to go to a casualty by the Nab Tower but as the boat was being prepared another incident was reported and so the Bembridge Lifeboat went to the Nab Tower incident. The D-Class was sent to help with an inflatable dinghy with two people on board and off the E Wittering beach, being blown out to sea on the NE wind. The S&R Helicopter had been called out and was on scene as the lifeboat approached, positioned so that the downdraught kept the dinghy from going further out to sea. The adult and child in the dinghy were taken onboard the lifeboat and transferred to the shore where they were reunited with their family. 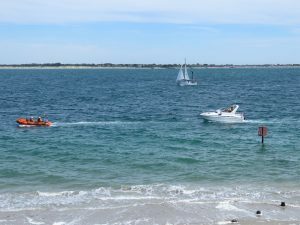 The dinghy was towed ashore and the family offered advice about small inflatables and offshore winds! Dates : 7, 8, & 9 August. Times launched : All mid-late afternoon. Times returned : Approx 1-2 hours later. Weather : Sunny and warm and ideal for the beach! Winds light to moderate. The summer weather and school holidays have brought visitors to Hayling and the Wittering beaches, with 8 missing children over three days. Crowded beaches are a haven for children to wander off and get lost. W Wittering lifeguards do a really good job returning children to their worried parents and only call the lifeboats out when other searches have been done, but they felt the need to call us especially on Saturday August 8 when we searched for 5 children. Fortunately all 5, and others on the adjacent days, were found safely on shore. More recently we were called out to help a ‘body’ in trouble with an inflatable dinghy, but on reaching the dinghy we found it was anchored and the ‘body’ was an orange buoy! It could have been otherwise, as with the children, so these are never fruitless rescues. The lifeboat was paged to go to help a motor boat drifting 3 miles offshore and in line with the funfair on Hayling. The Atlantic 85 was already busy so the smaller D-Class lifeboat was launched. By the time the casualty was reached the wind and tide had pushed her west and the Fairline Motor boat was about 1 mile off Fort Cumberland. A tow was set up but the smaller ILB Lifeboat made slow progress across Hayling Bay and unfortunately two of the children on board became seasick. The boat was taken into Sparkes Marina (pictured passing the Lifeboat Station) and moored safely. The two children rapidly recovered and so the lifeboat returned to the station. Weather : Fine with a WNW F4 wind. A large 13m motor sailing yacht ‘Shimmer’ lost engine power due to overheating and then had difficulty taking its sails down. The D-Class lifeboat was launched and found the casualty 2.5km to the south-east of W Pole mark. It was sailing towards the shore so a crewman went on board and set up a tow, which enabled the lifeboat to pull the boat into the wind and the crewman took the sails down. The vessel weighed 17 tons but the lifeboat towed her into the harbour and then to Sparkes Marina. Unfortunately there was no room for the large vessel and so the lifeboat had to turn ‘Shimmer’ round and go out into the harbour and wait. After 40 mins of hard work to hold the boat in place, space had become available and so the casualty could be moored. Investigation showed that all the coolant had leaked from the engine and hence it had overheated. A motor vessel went aground on Pilsey Sands and after some confusion about its position the Atlantic 85 reached it. A tow was set up and the casualty was towed off the sand bank and then, in case of leaking problems, escorted the boat to Sparkes Marina. Once safely moored and with no problems the lifeboat was stood down. 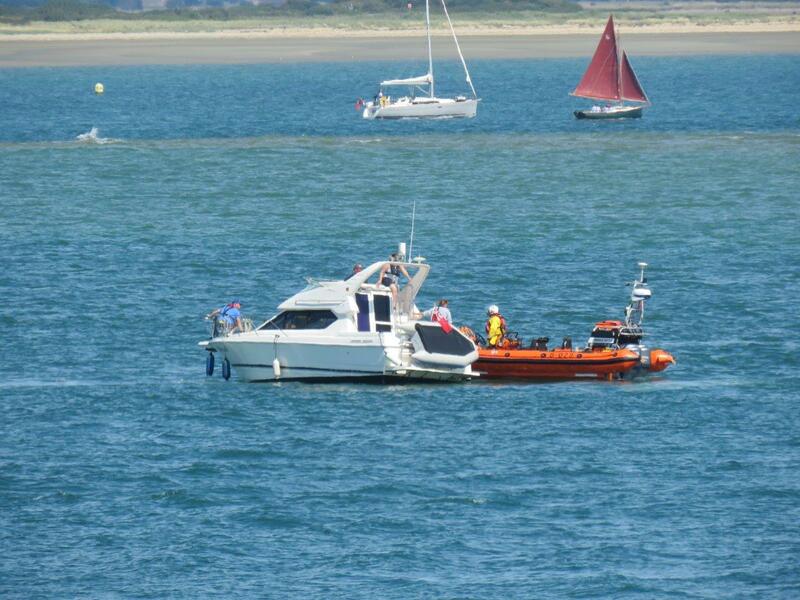 Hayling Lifeboat rescues a team in the Langstone Gig Regatta. Weather : Bright and breezy with F5 SW wind. A crew in the Round Hayling Race on Sunday 5 July ran into difficulties near the entrance to Langstone Harbour as some big waves swamped the boat and they called for help. The Langstone Cutters Gig Club held a two day regatta over the weekend of July 4/5 and the Sunday race was around Hayling Island. The weather was fine and sunny but with a strong SW wind blowing hard across the sea front. One of the teams consisted of 3 men and 3 women were rowing in a Solent Galley. All went well for them, although they were not the leading boat, until they reached a position off the Hayling Golf Club. There the wind was causing some big rolling waves to build up over the Winner Bank and the boat became swamped with sea water. Although some of the crew kept rowing whilst the rest were furiously baling out the water, they were not winning and so called for help. The Atlantic 85 lifeboat was being launched to go to another incident when the message came through but was diverted to go to the more urgent casualty crew. (The smaller lifeboat was launched to assist in the other incident.) Arriving on the scene the lifeboat crew found 6 wet, cold, rowers in a boat full of water. The rowing crew were taken into the lifeboat and the casualty vessel left in the care of Hayling Rescue which had also responded to the request for help. The six cold crew were taken straight to the Lifeboat Station and the lifeboat was recovered and taken into the Boat Hall before the casualties were taken off. They were given blankets and hot tea and soon felt better after their experience and none needed medical assistance. 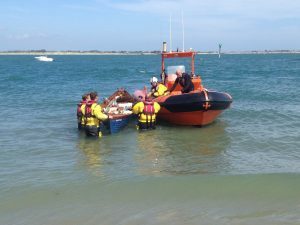 The Solent Galley was towed in and recovered at the station (pictured with Hayling Rescue rib and lifeboat crew) from where it was later recovered by Langstone Cutters and taken home. Even on a warm bright sunny day the sea temperatures around the UK still cause someone in the water, or even as in this case, sitting in sea water in a boat, to become distressed very quickly, but in this incident it was good to get the crew to a warm safe place before more serious hypothermia could set in. Hayling Lifeboat responds to a MAYDAY call after two boats collide. Weather : Fine & sunny but with a SW F5 wind. 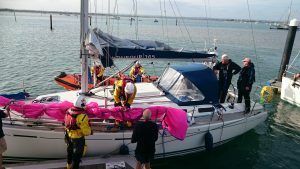 The skipper of a 44ft yacht put out a MAYDAY call to the UK Coastguards, after his sailing yacht collided with the bow of an anchored fishing boat in Hayling Bay. The Hayling RNLI Lifeboat crew were at the station on Saturday 4 July getting ready to take both lifeboats to support the Ship Inn Raft race, when a MAYDAY call was heard reporting a collision between two vessels. The Duty Launch Authority was called and a request from the UK Coastguard to respond was received. The Atlantic 85 was launched almost immediately and went to where the two casualty craft were in Hayling Bay. They found the yacht ‘New Dreams’ which had been sailing, and a Merry Fisher motor boat ‘Captain Jack’ anchored where it had been fishing. ‘New Dreams’ had made the emergency call immediately following the impact.Lifeboat crew members were put on board both casualty boats to assess any damage and crew injuries. The fishing boat had sustained damage to the pulpit rail and the bow but no water was getting into the boat. None of the crew on either boat was injured. Senior helm Andy Ferguson said’ This was an unfortunate collision but a lucky one in that it did not result in any serious injuries.’ Having exchanged contact details the skipper of ‘Captain Jack’ was happy to make his way back to Southsea Marina unassisted where he was met by the Portsmouth Coastguards. 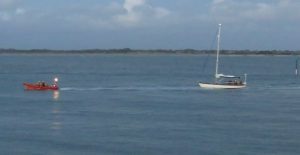 The yacht skipper also proceeded on his way into Chichester Harbour escorted by the lifeboat and it was a grateful crew that then made their way home after a rather too eventful trip back. Joint rescue by RNLI Lifeboats saves yacht with sails in a twist. A competitor in the Round the Island Race on Saturday 27 June got into trouble when its spinnaker control lines got tangled round the sail and also round the propeller and rudder. 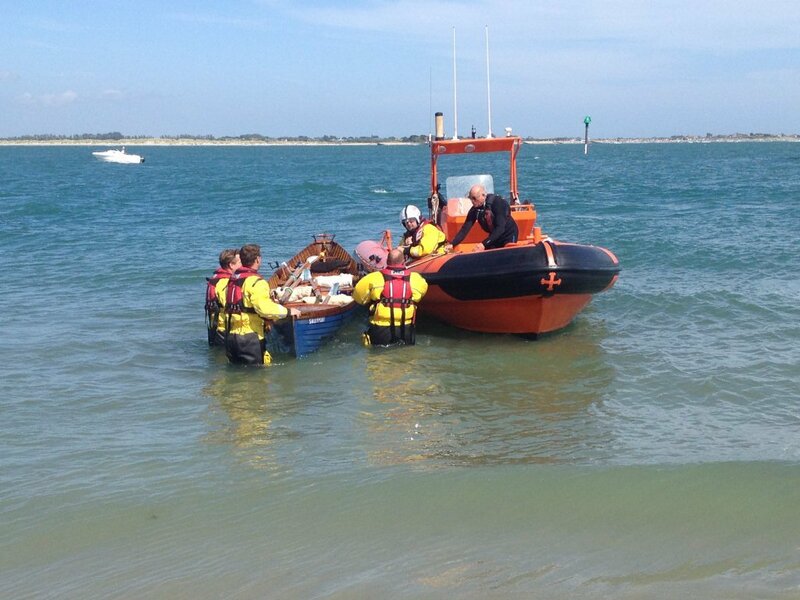 It was rescued by the Selsey and Hayling Island RNLI Lifeboats and brought to safety in Chichester Harbour. The UK Coastguard contacted Hayling RNLI asking for assistance as the Selsey Lifeboat had the Dufour 365 yacht ‘Mojito’,’ in tow, since the spinnaker had got out of control and the ropes tangled round the rudder were making it constantly want to steer to port. Selsey Lifeboat could not tow her into the harbour in this state so the Hayling Atlantic 85 was launched and once on scene put a crew member on board to rig a line back to the Atlantic. Then the two lifeboats, with Selsey towing and Hayling acting as a drogue, slowing the yacht and keeping it on course, were able to bring her into safer water. In the harbour they were met by the Harbour Patrol Vessel and an attempt to ‘unwrap’ the spinnaker lines by turning the boat through the wind was made but with no success. The rescue boats then took ‘Mojito’ to a visitors mooring off HISC to create a more stable platform and with the aid of a bosuns chair a crew member was hoisted up the mast and was able to drop the spinnaker. The Selsey Lifeboat returned to its base and the Hayling Lifeboat rigged an alongside tow and took the yacht into Sparkes Marina where Hayling Rescue crewman dived to try and release the fouled propeller. This proved impossible so all rescue boats left her safely secured and were stood down. A fairly long and involved rescue had proved a relief to the crew of four whose race ended earlier than expected, but with no injuries or further problems other than how to get home and how to get the rope off the prop! Ladies in the mud saved from the incoming tide. Weather : Fine and dry but with a F5 W wind. Two ladies who took a short cut whilst out for a walk with friends, were trapped in the mud in Snowhill Creek and were rescued by Hayling RNLI Lifeboat in the nick of time as they were in danger from a rapidly rising incoming tide. The UK Coastguard contacted Hayling RNLI following a report from the W Sussex Fire Service that a person was possibly in the mud behind East Head/east Wittering and they asked the lifeboat crew to investigate. The D-Class Lifeboat was launched and made its way towards the inlet behind East Head known as Snowhill Creek. Whilst en-route the Coastguard updated the report that the location was correct but that there might be 4 people in difficulty. On arriving at the scene the lifeboat crew found two people on the shoreline and so safe but two others in the mud and not far from the deeper channel. With a fast incoming tide these casualties needed to be rescued and as the lifeboat was able to get quite close to them they were taken on board and kitted out with lifejackets. They were two ladies, one French and one Spanish, who had been walking at the Witterings and got into the mud, and had they not been rescued when they were, they could soon have been in serious trouble. They were taken by lifeboat round to the W Wittering beach and put ashore where they were handed over to the Coastguard team to help them recover from their ordeal. Whilst on exercise the Atlantic 85 was diverted following a telephone call asking for help to go to a kitesurfer in trouble off the Inn on the Beach Restaurant. Having asked the caller to ring the UK Coastguard and after checking with them, the Lifeboat was diverted and very quickly was on scene. They found the kitesurfer who had his lines tangled and who was very tired. He and his rig were taken on board the lifeboat and transported back to the safety of the shore. Members of the public on the beach at Sandy Point reported that there were three people and a dog on the sandbank south of the harbour mouth, and that they were cut off by the tide. When the Atlantic 85 reached them a few minutes later, they found that they had kayaks with them and that they had just paused for a rest and a stretch! The UK Coastguard was informed and the lifeboat returned to the station. 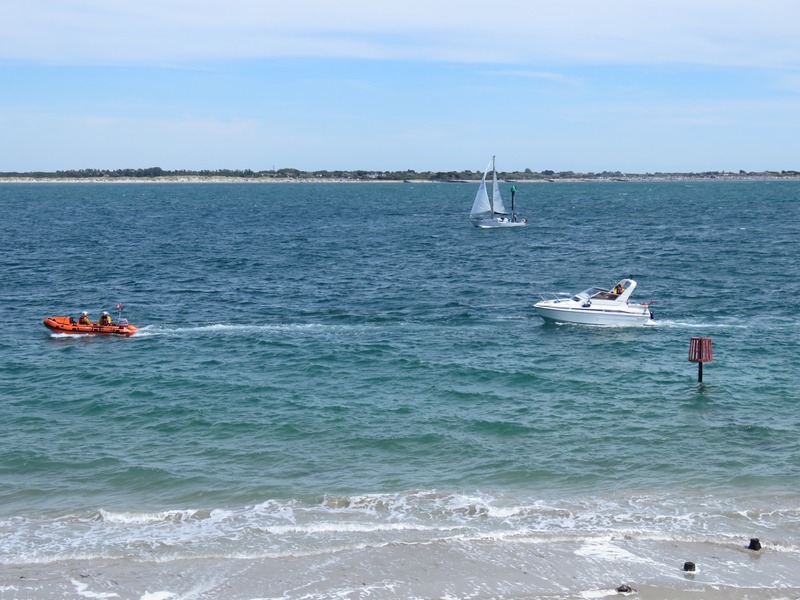 A kayaker was seen by the public clinging to a buoy just off the beach near the Beachlands Fun Fair. UK Coastguard asked us to assist and we launched the Atlantic 85 which was on the scene in 5 minutes. They discovered a young man who was very tired and cold, close to hypothermia. and clinging desperately to the buoy. He was taken on board together with his kayak and the lifeboat returned to the station where the man was warmed up with blankets and a hot drink. He recovered quickly and a crew member took him and his kayak back to his holiday let, very grateful for his rescue. Lifeboat rescues two vessels with engine failure. UK Coastguards asked us to go to assist a fishing vessel, the ‘Joshua Morgan’ with engine failure. It was west of Selsey Bill and close inshore near the Hounds Rock, so the Atlantic 85, which was still on the slip having just returned from training, was immediately launched and soon reach the stricken vessel. A lifeboat crewman went on board and set a tow and the casualty was towed towards Sparkes Marina. Unfortunately local coastguards were unable to attend and a commercial tow was not available so it was agreed to take the ‘Joshua Morgan’ to her home berth in Bosham. Returning from this rescue the lifeboat was flagged down by a rib who also had engine failure. It was agreed that the vessel could be taken to the Itchenor slip where the rib was put ashore. Once safe the lifeboat returned to the station. Committee boat catches a lobster pot. UK Coastguard requested we launch to go to a yacht in Hayling Bay with a fouled prop. The lifeboat was soon on scene and found that the yacht, which had been acting as the committee boat for racing, had lifted its anchor and a lobster pot line came up too. The crew cleared that but the line then sprang back and fouled the prop shaft. Lifeboat crew went on board and into the water and eventually cleared the rope and the yacht was taken in tow for Chichester Harbour. The two crew on board the yacht were very tired and it was agreed that they could be towed to their mooring in Emsworth. Once delivered safely the lifeboat returned to the station. Weather : Blustery F7 Easterly wind. We were tasked on Bank Holiday Monday to go to assist a Fletcher 22 Motor Boat that had run aground on the Winner Bank within sight of the Lifeboat Station. The Atlantic 85 was launched and was at the scene within a few minutes. There were 2 adults and 4 children on board so having secured the vessel thay were taken off and landed at the lifeboat station. The skipper was returned to his boat and as the tide rose later that night and since his outboard engine was not damaged, it was decided that with RNLI crew onboard the boat could motor off the bank. The lifeboat escorted him into Sparkes Marina and then returned to the station. Windsurfer gets ashore without help. Having been out earlier in the afternoon the Atlantic 85 was called into service by the Coastguard with a windsurfer in trouble. The surfer was near West Pole to the south of Chichester Harbour. When the lifeboat arrived it found that the windsurfer had made it back to the beach unaided. The Atlantic 85 was launched in response to a Coastguard call about a leisure fisherman on a charter boat ‘Valkyrie’ who had overdosed on seasickness tablets and had collapsed. The Atlantic 85 reached the vessel and two crew went on board to give first aid. The lifeboat helm decided that as the vessel was making 10 knots into the harbour in a confused sea and had plenty of deck space, the casualty would have a more comfortable ride into calmer waters than on the lifeboat. The two boats initially headed for Sparkes Marina, but the Coastguard had scrambled the S&R Helicopter which then airlifted the angler to hospital. The lifeboat crew were transferred back to the Atlantic 85 and both lifeboat and ambulance were stood down and returned to their bases. Yacht goes aground suspecting a leak. Weather : Fine with a sharp NE F4 wind. The Coastguard alerted us to a request from the Hampshire Ambulance Service to go to a 61 year old lady who had fallen from the Chichester Harbour sea wall and broken her ankle. She had been walking from Emsworth and fell in a remote area near Coniger Point, Warblington, and the ambulance could not get to her. The D-Class was launched as she can go into shallow water and soon located the lady who was being attended to by the paramedics. She was gently lifted onto the lifeboat and taken to the Pook Lane slipway where the ambulance could get close to her. She was taken into the ambulance and whisked off to hospital, leaving the lifeboat crew to return to the station. The Atlantic 85 lifeboat was on a training exercise covering capsize drill when it was tasked to go to the top of Thorney Channel in the vicinity of Thornham Marina, as there had been a report of a person in the water. 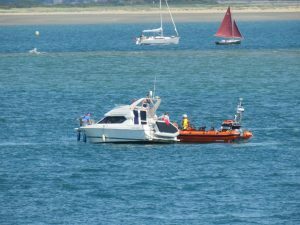 The lifeboat arrived at the same time as the Chichester Harbour Patrol Vessel and they found that the person had been taken out of the water onto the marina pontoon and was being attended by members of the public. The lifeboat crew together with the Chichester Harbour Patrol crew, who are community first responders, carried out a first aid assessment. They asked if an ambulance had been called and when told it had not, directed a member of the public to dial 999. When the ambulance arrived the lifeboat crew briefed the paramedics and the person was taken into their care. The lifeboat then returned to the lifeboat station. Following a request from the Coastguard the Atlantic 85 lifeboat was launched to go to a vessel in Bracklesham Bay which had made a PAN PAN call as being unable to raise its anchor. The skipper had tried to raise the anchor and had burnt out the electric windlass in doing so. The lifeboat crew suspected it was caught on a fishing pot line and by pulling on the anchor line they managed to raise the pot line and took it on board. They then asked the skipper of the yacht to drop his anchor line a few metres and the anchor came free. The lifeboat helm having checked that the skipper, his crew and vessel were all OK returned the lifeboat to the station. Two windsurfers on one windswept afternoon. Two separate sailboarders came to grief inside Chichester Harbour on a very windy Sunday in March. The first casualty was reported to the Solent Coastguard as having been seen clinging to a buoy to the north of Hayling Island SC (HISC). Once launched it took a few minutes to reach the windsurfer and to take him aboard the lifeboat. Having also secured his rig, the casualty was taken to the Lifeboat Station and the lifeboat recovered, but whilst refuelling, a second call from the Coastguard sent us out again to look for a second sailboarder in trouble in roughly the same area as before. We soon located the second casualty who had managed to get onto a cruiser in the HISC moorings. A crewmember went on board to help dismantle the windsurfing rig and then both this and the person were taken ashore at the HISC pontoon. The lifeboat was then asked to look for an item in the water and found and recovered a child’s bodyboard drifting in the wind near the Camber mark. Fortunately it was quite damaged and therefore clearly not being used in the F8/9 gale and so no need to search for a lost child ! The crew returned to the station and this time were able to put the lifeboat away and ready for another service. Speedboat on our doorstep !! Earlier we had seen a small speedboat buzzing about in the harbour entrance but later in the afternoon we were alerted by the Coastguard to go and assist the small boat which had broken down. 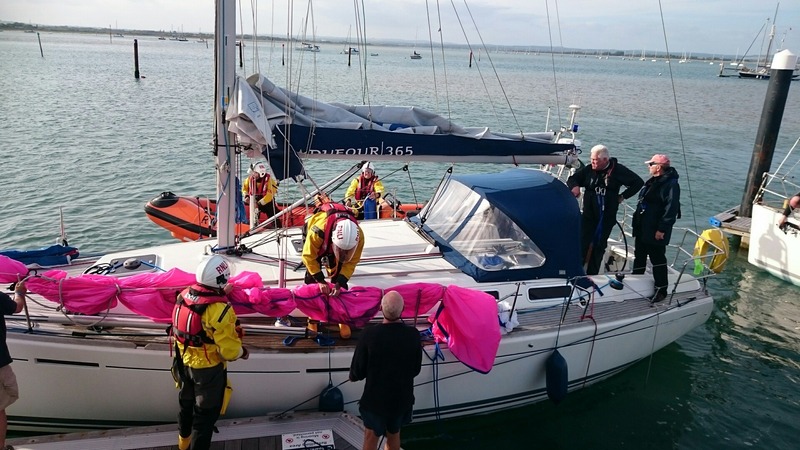 We found the casualty anchored in the entrance to Chichester Harbour with one crew on board. We set up an alongside tow and took the vessel into Sparkes Marina where her crew could get ashore and sort the engine problem. Once secure the lifeboat returned to the station. Solent Coastguard tasked Hayling Lifeboat to attend a Kitesurfer reported in trouble by a member of the public just off the Inn on the Beach Restaurant. When the lifeboat arrived on scene they found a surfboard in the water but on returning the board to the beach it became clear that this was not the casualty we were looking for. After a search the Lifeboat crew came across and spoke to another boarder and from the original description realised that this was who they were looking for, but he was not in need of assistance. The Lifeboat then returned to the Lifeboat Station.